Sand flea bites are one of the negatives of going to the beach known to every beach goer. During the summer months, as people flock to the beach, sand flea bites become more and more prominent as a common predicament along with sun burn, but what exactly are sand flea bites? Sand Flea Bites – Where Do They Come From? Sand flea bites come from the sand flea, an insect-like crustacean with colors ranging from brown to black. Majority of the sand flea bites incurred by humans did not come from sand fleas, but perhaps from similar looking creatures or from those creatures which produce the same symptoms in their bite, like the sandfly in out of US areas. In the US though, the two terms can be interchanged. A typical sand flea is only 1/8 of an inch long and inhabits coastal areas. It is also sometimes called a sandhopper. Sand Flea Bites – How Does it Look Like? A bite from a sand flea looks like a typical flea bite. It is actually a sting which can develop into lots of lesions or welts. It will look red and oftentimes develops welts but other than a bit of irritation, it should not cause more than rashes and inflammation. More severe manifestations can be because of other creatures, like the Chigoe or tunga penetrans, a nasty blood-sucking insect insect which is often mistaken as a sand flea. Going home from the beach with some welts or rashes which form in clusters on the skin is a dead giveaway that those marks are sand flea bites. Other manifestations include severe itchiness and red raised areas of the skin. They can be outright painful as well. 1. Wash and clean the area where rashes have developed to prevent further irritation and contamination. 2. Apply Benadryl cream to minimize the itchiness. Chamomile and Aloe in cream or ointment form may also be applied to help soothe the rashes. It is important to resist scratching the rashes to prevent secondary infection. 3. Observe the area bitten by the sand flea. Some creatures have bites which initially mimic the bite of the sand flea. It is important to note that any other more serious manifestations than rashes and a bit of welts means a secondary infection or may be caused by other creatures. Seek immediate medical attention especially if the bites were sustained from a tropical location. Wear bug repellent. 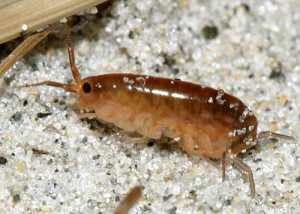 Although sand fleas are not bugs, the smell and taste of the bug repellent would prove to be an effective deterrent to a bite. Wear socks or foot covers on the beach. The favourite areas of sand fleas are the feet probably because it is the most accessible part of the human body to them. Avoid lounging on the beach in the early morning or late afternoon. Sand fleas tend to be on the beach at these hours of the day because their tiny bodies cannot withstand the too intense midday sun. Avoid cluster of seaweeds that have washed unto the beach. Sand fleas eat seaweed and where there are a lot of seaweeds, there will be bound to be many of these tiny creatures about. A bite from the common sand flea is indeed painful and very itchy, but it should not cause more issue than simple welts and rashes and should get better in a number of days. Any other manifestations which are more than that could be because of other causes and should be taken seriously. Many other creatures like the nasty Chigoe bug can burrow in the skin and cause major problems although their bites may initially seem like common bites from the sand fleas.